The National Environmental Management: Biodiversity Act (NEMBA), Act No. 10 of 2004 (RSA 2004), seeks to prevent future invasions, and to manage current invasions to minimise their negative impacts. Through this Act, SANBI is mandated to report on the status of alien and invasive species and monitor for new introductions; as well as provide scientific advice on their management. Alien and invasive species have been identified as a threat to South Africa’s marine biodiversity and as such a new programme of work has been initiated to address this. Globally, the field of biological invasions has grown exponentially. This is attributed to the increasing rate of biological invasions across multiple regions and ecosystems; and the recognition of their impacts to natural systems and socio-economic implications (Colautti et al., 2006; Reaser et al., 2007; Robinson et al., 2016). The rate at which marine organisms are introduced to new environments is high and South Africa is not an exception to this (Alexander et al., 2016; de Greef et al., 2013; Mead et al., 2011a, 2011b; Peters et al., 2014). These introductions occur on the coastal systems including rocky intertidal shores, sandy bays, estuaries, harbours/marinas (Byrnes et al., 2007; Grosholz, E., Ruiz, 2002; Jurk, 2011; Peters et al., 2014; Rilov and Crooks, 2009). Additionally, there is an increase in the translocation of marine species due to increased shipping traffic and commercial aquaculture (Mead et al., 2011a). 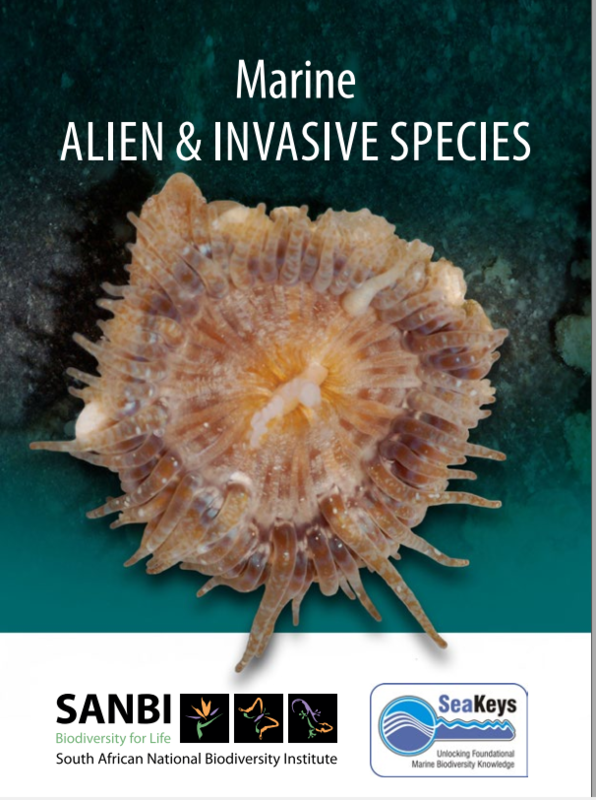 The SANBI Marine Programme, in collaboration with its partners, has initiated a project to revise and update the list of marine alien species. This includes prioritising identified research needs, increasing human capacity and providing scientific advice on management and potential eradication of these species. The Marine Programme is currently compiling species pages for marine alien species in an effort to inform risk assessment and to prioritise for barcoding of these species. Additionally, in order to facilitate the development of a national distribution map of marine alien species, the Marine programme is currently running a project on iNaturalist for South African citizen scientists and the public to upload their observations. The availability of information is often the barrier between important issues and public awareness. 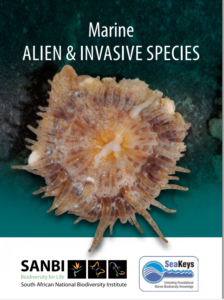 In an attempt to bridge this gap, the Marine Alien and Invasive Species Researcher at SANBI created an easy to read booklet that can be used as a ‘field guide’ for marine alien and invasive species. The purpose of creating the booklet was to raise awareness to members of the public who work in harbours or ports, marine protected areas and people who live along the coast so that they are able to identify and report any sightings of these species. The booklet gives short descriptions and images of 16 alien and invasive species, their impacts and the habitat that you are most likely to find them in. In the event of identifying any of the species described in the booklet, we encourage people to use the contact information provided at the back of the booklet to report the location.